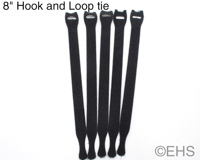 Pack of 5 -- 8" black hook & loop (Velcro) wire ties. 8" long and 3/4" wide (at the widest part). Good for about 5" circumference or about 1.6" diameter.